Myths and old wives tales are heard by most pregnant women at some point. Some of these myths surround predicting the gender of the baby and others are just general bad advice for pregnant moms. Here are some of the most common pregnancy myths that you may hear during your pregnancy. How you are carrying the baby will predict the gender. Inevitably people will take a look at how you are carrying the baby and try to guess the gender. You may be told that you are carrying high so the baby is a boy. Carrying all in the front is also said to mean the baby is male, while carrying more to the sides is considered a sign of a girl. These are all not correct. During my pregnancies, I would have people making complete opposite predictions based on my belly. 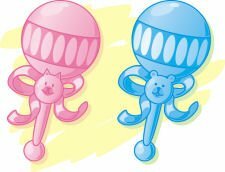 Games to predict the gender are fun for showers, but not accurate for predicting the baby’s gender. One is to mix the mother’s urine with Drano. Greenish blue, green or blue colors are said to indicate a girl. Brown, black or a blue-yellow color is said to mean a boy is on his way. Other than being gross, this method will not predict the gender of your baby. Another game is to put the pregnant mother’s wedding ring on a string and hold it over her belly. The way the ring moves is said to indicate a boy or a girl. None of these methods will predict the gender of your baby. They are fun for conversations or shower games, but none of them will accurately predict the gender. The only way to know the gender of the baby is with prenatal testing. Ultrasound or amniocentesis will give you the information, but neither should be done just to determine the gender. Don’t raise your arms above the head or the baby can get strangled by the umbilical cord. This is a common myth among the older generation that can strike fear into the hearts of expectant mothers. Most of us will worry about the baby’s well being at some point in pregnancy. Worry about the baby getting tangled in the umbilical cord is a common fear. There is nothing that can be done to prevent this and there is nothing you can do that will cause it. About one quarter of all babies are born with the cord around the neck and in the vast majority of the cases, the baby is perfectly fine. It is the baby’s movements that cause this, not anything you do or do not do. Have a baby, loose a tooth is another common tale told by the older generation. This one actually does have some basis in reality. In past generations, lack of dental care and poor diet were often responsible for lost teeth in new mothers. Your baby needs calcium for growth. If there isn’t calcium available from dietary sources, it will be leached from your bones and teeth. The way this is now prevented is with diet and supplements if needed. It is also advised that you see your dentist in the second trimester for a cleaning and exam. Some myths surround the idea of denying cravings. There are a bunch of these out there; again many are perpetuated by the older generation. One saying is that if the mother denies a craving, her baby will be born with a birth mark in the shape of that food. Others include the idea that denying a craving will cause fluid to come out of the ears or the mother to get a sty in her eye. These are all untrue and have no scientific basis at all.